In the old days church attendance was compulsory. People living in the north part of Prescott had a hard time with the long distance to Prescott Hill for services. To solve the problem a decision was made to build a new church closer to home. Wasting no time, the North Prescott Methodist Church became a reality in 1837. It was built on a jog in the town line between Prescott and New Salem. The parsonage beside the church was in New Salem. In May of 1903 the church was severely damaged by a lighting blast causing necessary changes and repairs. Rev. Betcher was the minister. The singer’s gallery was removed, the interior of the church remodeled, stained glass windows cost $11.50 each replaced the broken plain glass ones. The two front doors became one center door. The upstairs became the Sunday School room. The steeple was extended and a bell added. The bell was never used and much later given to the South Athol Methodist Church where it still calls people to worship. In 1947 parishioners heard that the MDC had plans to demolish the building because it was 20’ inside the proposed watershed. 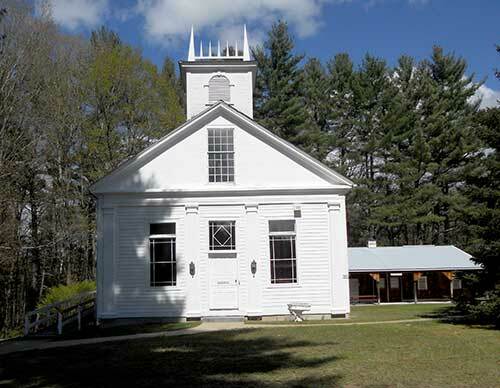 Originally a Methodist Episcopal Church, it was built in 1837 right on the edge of the Quabbin Reservoir. This picture shows work being done to the steeple. The building is now the Prescott Museum and is part of SRVHS located on the museum grounds in New Salem. 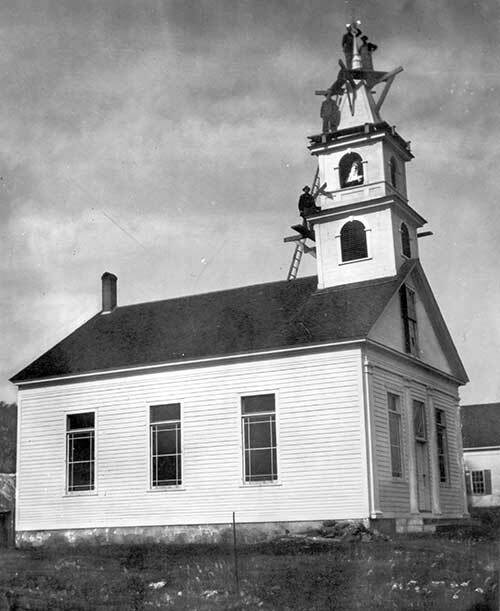 In 1985 a decision was made to merge with the Swift River Valley Historical Society and once more moved the Prescott Church. It was placed on a foundation which allowed for a kitchen, bathroom and office space. Many pictures were taken on a beautiful fall day as the church took one last journey! And now, after 181 years this House of Memories is asking for your help to make the steeple safe and attractive again. For 181 years people have cared enough to take care of it. Can’t we? This entry was posted in Uncategorized on May 29, 2018 by srvhswp. The Swift River Valley Historical Society is the leading resource in preserving the artifacts, stories and records of the lost towns of the Quabbin Valley; in collaborating with communities, organizations and agencies to provide educational opportunities and programs about the history of this region; and in ensuring appropriate management and protection of those resources and artifacts including the Quabbin watershed to engage public interest and support. The museum will be opening Sunday, June 23rd. It will be open every Wednesday and Sunday afternoon from 1-4 pm until September 22nd. You may reach the museum by calling 978-544-6882 or by emailing dotfryesrvhs@gmail.com. The archives are available for research by appointment by contacting megansrvhs@gmail.com. Archives exist both to preserve historic materials and to make them available for use. Read “A Guide to Effective Research” from the Society of American Archivists. During the year we have been gifted with many more artifacts and wonderful pieces of the Lost Valley history. We are grateful to all of the individuals and families who have shared a piece of their personal histories that we might share them with you. The Archives are open through the winter by appointment (megansrvhs@gmail.com) and new displays will be in the museum for the 2019 season! Plan ahead for your visit. We will be delighted to see you.